Earlier this week we shared a picture that may have surprised some of our readers: a side-by-side comparison of Wednesday’s top ebook recommendations from our BookGorilla service and another popular service called BookBub. If you were looking for great deals on titles that most readers have heard of (which is certainly not the only worthwhile measuring stick), it was clear that you’d be far more likely to find them on BookGorilla than on BookBub. If we say so ourselves. And we do. If price-per-unit is your main consideration in acquiring books for your Kindle library, you may well want to go with BookBub. In today’s comparison, for example, BookBub’s top book recommendations were available for an average price of $1.45 in the Kindle store, while the average price for BookGorilla’s top recommendations was $1.91. If you participate in a Kindle author fantasy league and you want to know which previously unknown book is most likely to vault from a sales ranking of 688,529 to the Top 100 Kindle bestsellers in the next 24 hours, BookBub’s also your best bet. It’s true that several books featured on BookGorilla make Amazon’s Movers and Shakers list each day, but they generally don’t have as far to go to make that list. And subject to check, BookBub has approximately a gazillion subscribers, many of whom still open each day’s BookBub alert. Numbers like that are sure to move just about any needle, no? Finally, among authors and publishers for whom money is no object when it comes to their marketing budgets, BookBub’s a clear choice. 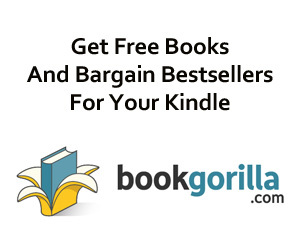 You may spend as much as $1,975 for a single promotion on BookBub, but you’re likely to get a bigger bump than you will get for $40 to $200 with BookGorilla or similar amounts with other well-managed services such as eReader News Today. We could probably go on, but of course we’re not here to do BookBub’s work; they are very effective on their own behalf. And as we will try to explain in a new post this weekend, there are some very good reasons why BookBub wants readers to focus on the books that it includes in its daily ebook alert, even if you’ve never heard of them before. A cozy mystery from a bestselling author… Now 67% off!